One of the Flanders graveyards. 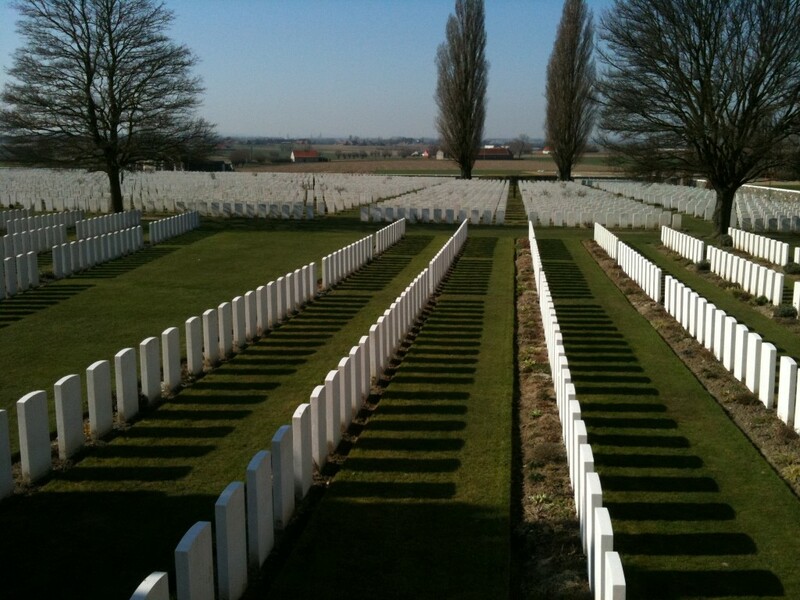 Hmmm… what does one say about Flanders fields? We saw no poppies, but the farmers’ fields ploughed ready for planting gave the barest hint of what the land looked like 100 years ago. harvest” of bombs, shrapnel, guns, tools. They also turn over body parts with regularity which would be alarming elsewhere. We visited several cemeteries during our day. Apart from the sheer scale of destruction reflected in the massed headstones, the other thing that hits you immediately is how few of the remains have a name attached to them. 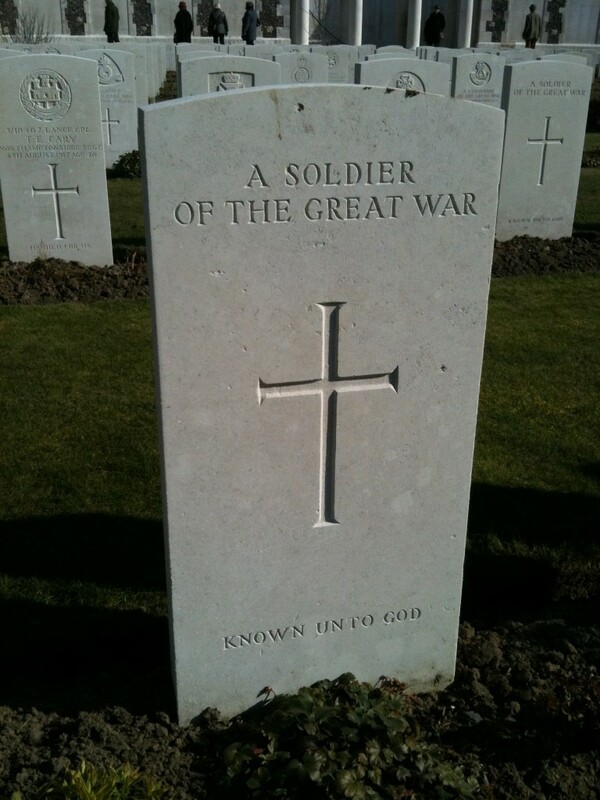 Most headstones simply state “A soldier of the Great War. Known only unto God.”. Numbers and words cannot convey how many of them there are. I know because we read up on this before we visited; but only visiting really begins to convey the extent of the deaths involved. Most graves are like this. 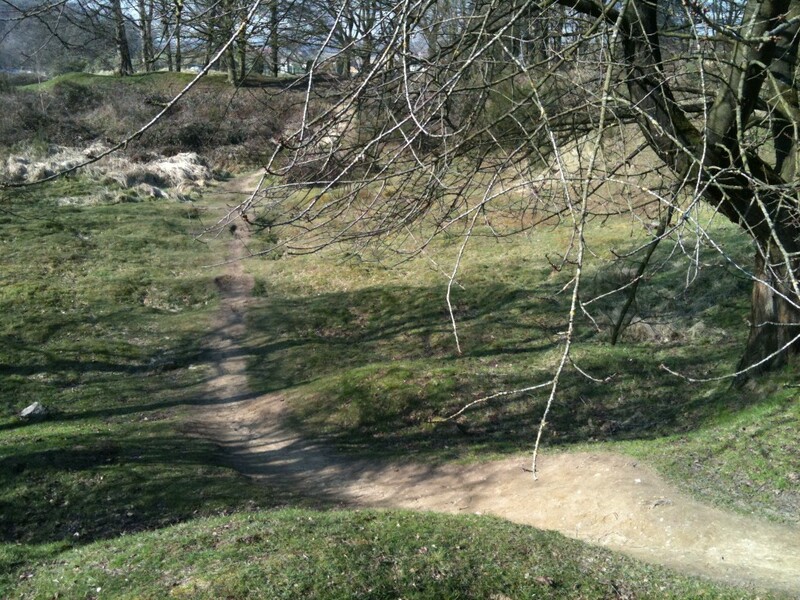 Hill 60 was the most untouched place we visited. In the flat landscape of the low countries, being a 60m tall pile of tailings from railway building qualify both as a hill and as a strategic highpoint. Now it is a mild rise topped by an enormous crater. During the later half of the war it was undermined by Australian miners. They managed to set off a pile of explosives that created a bang large enough to be heard in London. It remains the third-largest man-made, non-nuclear explosion in history. Over 10,000 Germans died instantly. Taking advantage of the death and confusion the Australian and British forces advanced and gained about 3km of land for remarkably few, in World War One terms, losses. Hill 60's crater. Hard to convey in a photo. Rather than capitalising on the gains made by this successful strategy, the commander-in-chief instead got rid of the General who’d come up with it. Replacing him with an old-fashioned crony much more of his own way of thinking, Commander-in-Chief General Haig then waited a while to allow the Germans to regroup before hurling hundreds of thousands of troops to their death seven weeks later. It’s possible to have an interesting debate about the rights and wrongs of WW1, but the actions of some of the allied commanders are just unconscionable. Having seen the well-kept memorials and cemeteries we were pleasantly surprised at how fondly the Belgians remember the fallen of Britain, Australia and Canada. Then in the afternoon we visited an archeological site where a group of local amateurs had dug up an intact British trench and bunker complex. They had found over 200 bodies on the site and saved them for respectful burial. This was all to the good. But the site was surrounded by a new industrial estate which had been built without allowing any time to exhume the bodies which inevitably form its foundations. Our guide and the archeologist we met we clearly disgusted by this, but is perhaps an indication of a shift in attitude by the newer generation of locals. The archeologist we met gave the boys some bullets and shrapnel he’d uncovered. 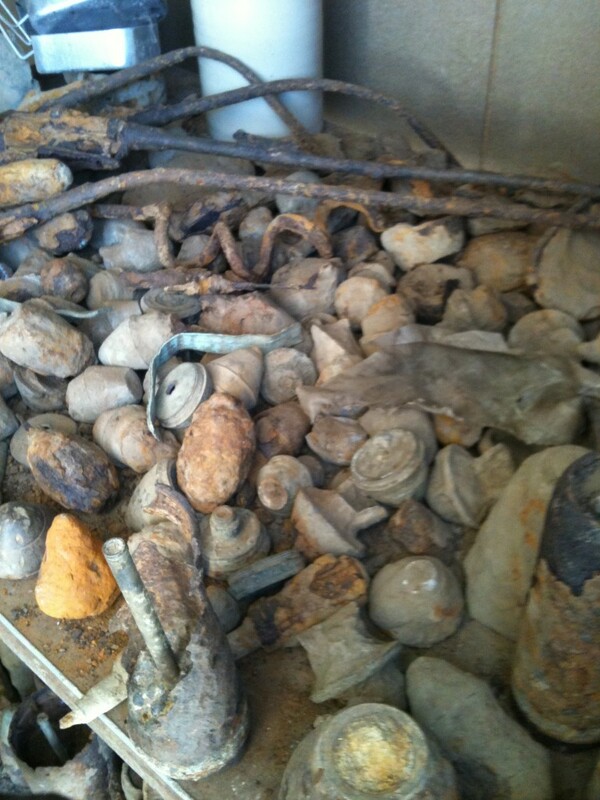 Earlier we’d seen piles of shells and hand grenades. The whole of the Western Front was peppered with so much metal that bullets pop up like pebbles on the ground. It’s just indescribable. Numbers like each 1m section of the front being hit by 3 shells every minute of every day for weeks on end. Like one ‘advance’ where the allies lost 3 soldiers for every meter gained – and they gained 3,000m – only to lose them the next day. Like that almost 60% of troops who went to the front were either killed or wounded. 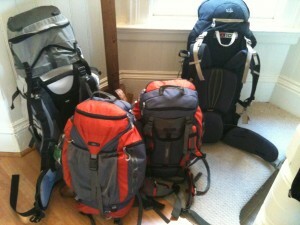 The statistics soon start to become overwhelming. We saw no poppies blow, it is too early in the year for that. 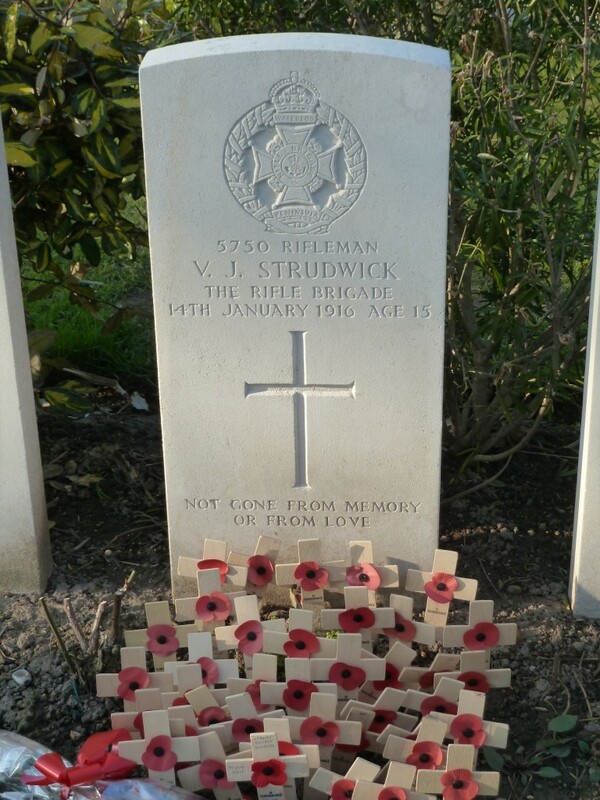 But we saw row upon row of headstones and we caught the barest whiff of a hint of the experience that so many young people lived and died through. Apparently after WW1 Churchill argued that the destroyed town of Ypres should be left as was in perpetuity as a reminder. The locals hated the idea and rebuilt it to mimic its state before the War. While I understand the locals’ motivation, I can also see the need to preserve some sense of the awful reality. A ploughed field gives you the barest idea of the baren, destroyed moonscape created on the Western Front; but while flowers bloom and birds sing, the reality of that idea is hard to hang on to. And only getting some sense of that reality will prevent it happening again.